Sport fishing is a huge part of the tourist economy of Cost Rica. In fact, studies suggest that sport fishing alone contributes more than half a billion dollars to the country’s economy. That is without other water sports, anthropological, cultural, or culinary travel tourism; just fishing for one or more of the fish species found along its coasts and inland. One of the top species coveted here is Marlin. There are Black Marlin and Blue Marlin, although most people seem to go after the blue ones. Perhaps they are attracted by their relative beauty as compared with those black cousins, but it doesn’t matter which one you are after as regards the places and times to fish. Marlin are only found along the west coast. This is divided into North, Central, and South Pacific areas. So right off the bat you know to steer away from a resort or hotel on the north-east, Caribbean coast and stick with the Pacific. Which towns attract tourists to this part of the country for sport fishing? They include Golfito, Los Suenos, Drake’s Bay, Papagayo, Tamarindo, and Samara. Your catch could weigh hundreds of pounds if you follow this fish to a top fishing location whatever time of year you visit. Any time of year is good for Marlin fishing and both types follow the same patterns. If you want to visit the North Pacific, plan for some time between mid-spring and late summer. In the Central part, winter is a good time plus late spring and early summer. In the South Pacific, best times are mostly in the winter with a bit of spring fishing in there too. Those are when the catch-rate is at its highest and your chances are substantial. The fish should be big, feisty, and abundant. Fishing is still pretty good the rest of the year for a total of around 10 months in each area. Breaking that down a little further, Papagayo or Flamingo would be a popular destination for fishing along the Northern Pacific coast. Choose Jaco or Manuel Antonio for easy access to Central waters. Drake’s Bay and Golfito are great locations for Marlin fishing in the South. Remember, though, that they are popular with every other Marlin fisherman or woman in the US, Europe, and Canada. You won’t be alone. Hotels and resorts book up quickly, especially as the season gets going. Book ahead of time after researching the topic substantially. If you want to learn more about this type of fishing, check out some fishing charter companies and magazines related to the sport more generally. This is a method which uses buoys and submerged items to attract bait fish which, in turn, cause Marlin to congregate in large numbers. The biggest benefit is to fishermen who have used this method commercially for a long time to catch other fish one can keep. Marlin must be released, but charter captains sometimes like FAD fishing (Fish Aggregate Devices) because it allows them to almost guarantee a catch for their clients. Some fishermen would say this is not sporting or rewarding enough. They would rather a captain go out with his knowledge of the ocean and of their quarry and teach them something about how to catch a prize fish. We found http://costaricasportfishingtours.com/marlin-fishing/ in our travels. These visitors look forward to a challenge both in locating and in bringing in their prize. Many such ships’ captains also supply gear so you don’t have to wonder what sorts of rods, reels, and accessories to bring on holiday. Leave those at home for domestic adventures with smaller, lighter species. Maybe it will not be a Blue or Black Marlin that tugs your line. Perhaps a Snapper, Tuna, or Mahi Mahi will come calling. There really is no way to lose here. As long as you possess a fishing license and hire a reputable, experienced captain, it is difficult to imagine even a three-day break, fishing every day, where you don’t get a bite from anything. These waters are potentially the most active for massive sport fish and a great place to introduce a novice to the excitement that’s in store. 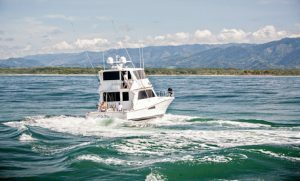 He or she might even feel a little spoiled after a sport fishing trip to Costa Rica if the next holiday takes a family to less abundant waters.